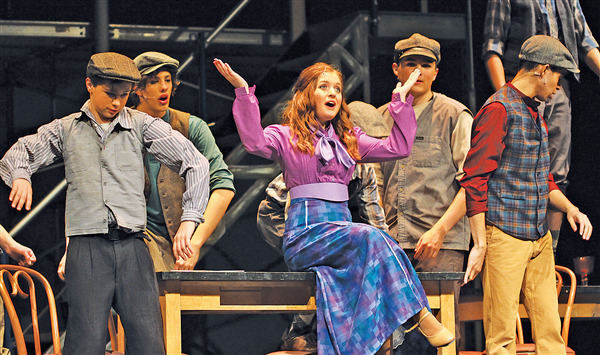 Northland Pines High School (NPHS) music and drama students will bring the New York City-based “Newsies” Broadway musical to North Woods audiences this weekend. 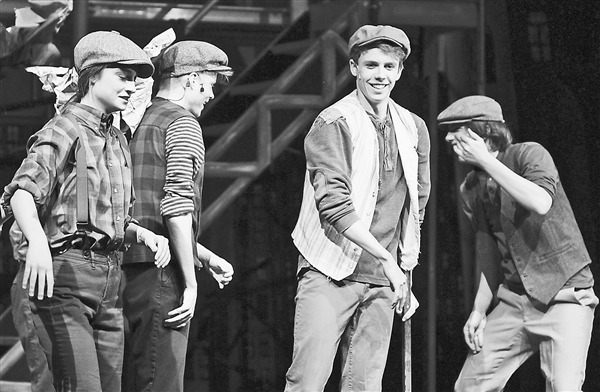 “Newsies” will be performed this Friday, Feb. 8 and Saturday, Feb. 9, at 7 p.m., and Sunday, Feb. 10, at 2 p.m. in the NPHS auditorium. When titans of publishing raise distribution prices at the newsboys’ expense, Jack rallies newsies from across the city to strike against the unfair conditions and fight for what’s right. Featuring the now classic songs “Carrying the Banner,” “Seize the Day,” and “Santa Fe,” “Newsies” is packed with nonstop thrills and a timeless message of hope and perseverance. Approximately 70 students are involved in the cast, crew and pit orchestra for the musical this year. Students playing major roles are: seniors Malcolm McCanles as Jack Kelly, Langdon Langhoff as Katherine, Sheamus Roelle as Davey and Colton Clure as Crutchie. Junior Dane Gleason plays Pulitzer, and senior Emily Klopp is Medda Larkin. The musical is directed by Kate Janssen. According to Janssen, three reviewers for the Jerry Awards program from the Grand Theater in Wausau and Overture Center in Madison will attend. “They will review our show and provide feedback on our production. If any students are recognized with nominations, we will find out later this spring,” she added. Adult tickets cost $5 and senior citizen tickets cost $2. Northland Pines students and staff are free of charge. Tickets will be available in the main NPHS office. Tickets are general admission but it is recommended to purchase tickets in advance. Remaining tickets will also be available at the door. Doors open 30 minutes prior to each performance. The Northland Pines Music Boosters will sell a variety of flowers at each performance, along with sponsoring raffle baskets to be drawn for at the Sunday performance. For more information, call the NPHS office at (715) 479-4473.